There’s No Negotiating With the Couillard-Coiteux Gang – Extend the Mobilization to the Private Sector, Prepare a Real General Strike! Build a Revolutionary Workers Party! 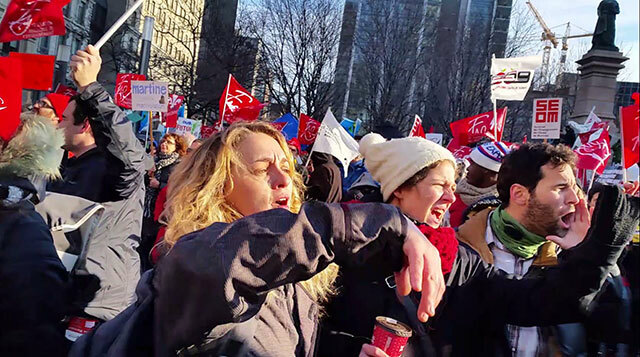 On December 9, government employees in Quebec carried out a one-day strike involving 400,000 workers, including over 100,000 teachers, health workers and others. 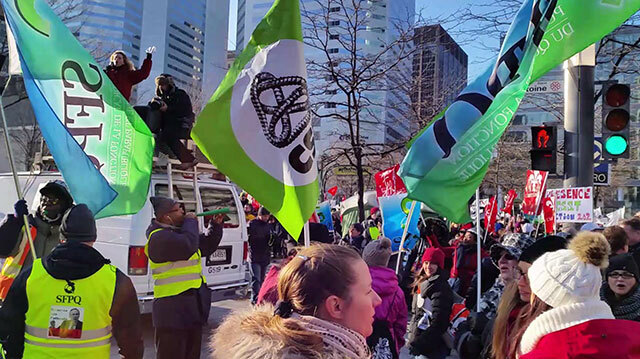 In Montreal an estimated 34,000 strikers marched and demonstrated against the austerity policies of the Quebec government, which refused to budge from its “offer” of a two-year wage freeze and a “raise” spread over five years that would amount to a cut in real wages. Another 20,000 reportedly marched in Quebec City. 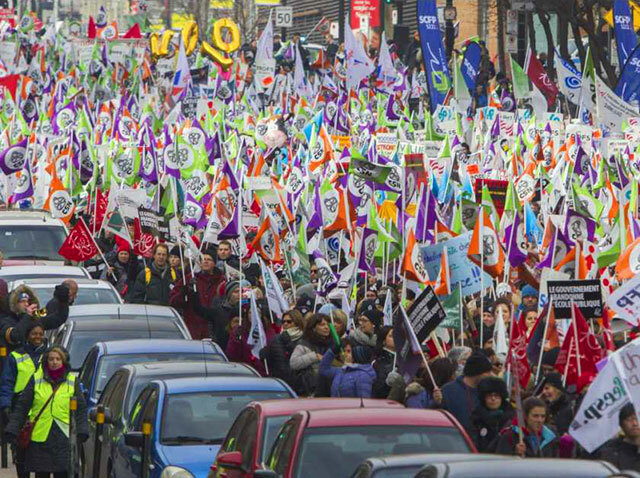 It was the largest workers strike and the largest labor demonstration in Quebec since 1972. On December 20, the leaders of the trade-union Common Front announced a “tentative agreement” in bargaining with the government. However, the 600 delegates of the Health and Social Services Federation (FSSS-CSN), representing more than a quarter of the unionists of the Front, recommended that the members vote down the phony deal. The League for the Fourth International distributed a leaflet at the December 9 demo, a slightly edited version of which, translated from the French, is printed below..
For more than a year, public sector workers in Quebec have been mobilizing to defend themselves against the abuses and anti-worker austerity policies of the government of Prime Minister Philippe Couillard and his henchman, Treasury Board president Martin Cloiteux. After the massive mobilizations of the Refusons l’Austérité (We Refuse Austerity) coalition and the student marches this spring, throughout the fall there have been a series of rolling strikes, demonstrations and picketing in response to calls by the inter-union Common Front and the different public service unions. Following the postponement of the strike planned for December 1-3, and faced with the refusal of the Liberal Party government to negotiate anything concerning wages and salaries, there will be a strike by the 400,000 unionized public sector workers on December 9 in conjunction with a three-day teachers strike. Demonstrators in Montreal’s Victoria Square at the end of the Common Front march on December 9. By all indications, this government of union-busters and destroyers of social services isn’t prepared to make any concessions. Couillard hasn’t moved a bit from his “offer” of a 3% “raise” over five years, with a two-year wage freeze, and raising the retirement age. This is not only an insult to the unions and workers – falling below the rate of inflation, after years of falling real wages – it’s a provocation. The bosses’ representatives figure that the unions will not be able to withstand the assault by the forces of “law and order” that they intend to launch should the union leaders fail to capitulate completely. Unfortunately, reducing the Common Front wage demand from 13.5% to 7% and suspending the national (Quebec-wide) strike, supposedly to demonstrate “good faith” and the “seriousness” of the union leaders, can only intensify the thirst for blood of this government of butchers. One has to understand that they have no intention of negotiating, ever. It’s reported that upon learning that the unions had cut their wage demands in half, the government took barely half an hour to study it before Coiteux tossed it in the wastebasket, declaring it “unacceptable.” Even the head of the Quebec Conservative Party and several radio figures remarked ironically in a joint statement that, “Pizzas should be delivered in 30 minutes or less, not government responses to concessions in negotiations with its workers.” The union bureaucrats complain of Couillard’s hypocrisy in pushing to raise salaries of deputies in Quebec’s National Assembly from $88,000 to $136,000 at the same time as he proposes to impose a cut in real wages for workers. And of the duplicity of Coiteux who prates about “zero deficit” while handing over $1.5 billion to Bombardier. But the calls for fiscal consolidation of public finances are just a façade to hide their real target, weakening and ultimately gutting the power of the workers movement. In the real world, as opposed to the Alice in Wonderland fantasy inhabited by union bureaucrats, the only way to get this gang of bosses’ thugs in suit-and-tie to cede is by mobilizing a superior force, that of the working class ready to defy the capitalist state. Let’s not forget that it was the previous Liberal government of Jean Charest who sent hundreds of agents of the Sûreté du Québec to crush at whatever cost the student strike against a hike in university tuition in 2012. Nor should we forget that the Parti Québécois government of Pauline Maurois who replaced Charest (with the support of student leaders) then introduced indexation (i.e., raising) tuition. The reality is that austerity is not a policy of choice, that can be undone by the next cabinet, but rather the condition for the survival of the capitalist system which has been mired in a worldwide depression since the crisis of 2007-08. One need only take a look at the experience of Greece following the election of SYRIZA (the Coalition of the Radical Left) in January 2015 on an anti-austerity platform. After months of drama, of political thunder and lightning, this bourgeois populist party – which in many ways resembles the Parti Québécois – ended up implementing even more drastic measures slashing pensions and wages than those imposed by the governments of the right. Neither elections nor a referendum in which 60% voted against the demands of the Eurobankers were able to stop the dictatorship of finance capital. When the Quebec Fédération Autonome de l’Enseignement (FAE – Autonomous Teachers Union) declared on December 3, after 64 useless bargaining sessions, that “The government is depriving teachers of collective bargaining rights,” it was quite right. Couillard would like to do in Quebec what Wisconsin governor Scott Walker did in the U.S. To defeat him what was needed was a general strike, for which preparations were underway. When the Wisconsin unions drew back at the last moment, they signed their own death warrant. In the course of the struggle against austerity in Quebec, there have been quite a few plans presented to redistribute wealth, for “more equitable taxation,” etc. Petty-bourgeois groups such as Québec Solidaire (which includes a large part of the reformist left) want to soften austerity. They are all doomed to defeat. The Liberal Party, which holds the reins of power both in Quebec and in Ottawa following the victory of Justin Trudeau in the last federal elections, has always been the party of big business. It defends the interests of its class, the bourgeoisie, and uses all the instruments at its disposal to do so – the media, corruption and above all the machinery of the capitalist state: the police, armed forces, courts and prisons. Trudeau the elder did so in 1970 when he sent the army to occupy Quebec at the height of the nationalist upsurge, as did Quebec prime minister Robert Bourassa, also a liberal, with the “special law” to crush the Common Front strikes of 1972. To defeat this strikebreakers and union-busters it is necessary to mobilize all the strength of the working class to shut down Quebec. That means, first off, it is necessary to extend the strike to the private sector, to the key sectors of the economy which produce the profits for capital, to the forest and mining industries, the aluminum plants of the Saguenay, to transport and strategic sectors, such as Hydro-Québec. Block the Champlain Bridge – the truckers will know how. It is necessary to prepare a real general strike, including the formation of workers defense groups, committees to ensure supplies of basic necessities, of workers councils in industrial areas, of communications teams. In 1972, workers took control of whole cities, such as Sept-Îles, where they seized the port and the radio. But it is the leadership that is decisive. In 1972, lacking a revolutionary program, the leaders of the Common Front were not prepared to confront the capitalist state, and so they ultimately capitulated. For a an all-out fight it is necessary to replace the pro-capitalist bureaucracy with a class-struggle leadership and to forge a revolutionary workers party capable of organizing our forces to overcome bourgeois repression. We need a Leninist party that acts as a “tribune of the people,” the champion of all the oppressed and discriminated, which is able to combine the struggle of students, immigrants, women under the leadership of a class-conscious working class. We must fight for free day care centers for all; for full citizenship rights for everyone living here, no matter where they came from; against all discrimination on the basis of religion or sexuality, like the PQ’s “Quebec Charter of Values”; for free, quality, secular education at all levels, abolish tuition. We need to build an internationalist party, which opposes Canada’s imperialist interventions, in the Middle East, Africa and Haiti, where Quebec police played a vital role in the United Nations occupation of the first black republic.